There is a tremendous wealth of mega-biodiversity in the world. But the very existence of this wealth is under threat due to habitat destruction, pushing animals towards inbreeding depression and thereby paving way for their extinction. This has made essential human intervention and assisted reproductive technologies. Thus, the issues of conservation of wildlife and biodiversity have become the need of the hour, especially in terms of policy making at the government level. 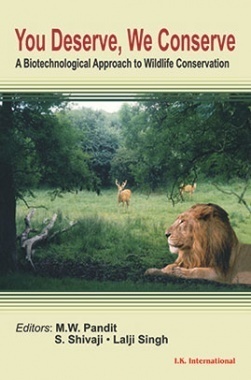 We Conserve: A Biotechnological Approach to Wildlife Conservation contains 16 articles by scientists engaged in research on the conservation of wildlife, role of reproductive technologies and modern approaches being followed in wildlife conservation. It also deals with various techniques used in field conditions such as chemical capture, molecular genetics, ultrasonography, cryopreservation, wildlife forensics, etc. The present book will be of special interest to professionals engaged in forest and environment related activities, particularly wildlife conservationists, students pursuing their career in veterinary discipline of wild animals and policy makers. It will also be useful for nature enthusiasts, who have an interest in wildlife. 1. A compilation of 16 articles, it focuses on the technological efforts useful in tackling the problem of conservation. 2. Deals with the project ‘LaCONES’, the first of its kind in the world, set up in Hyderabad, for the cause of conservation. 3.Includes three appendices, providing excerpts from the Inaugural Address given by Thiru. T. R. Baalu, wild links, and a detailed glossary. 12.Tiger, Tiger Burning Bright, Counting Our Tigers Right!